Cameron: Time to change pin! Vuvuzelas droned and South African flags fluttered as Olympic medalists Cameron van der Burgh and Chad le Clos arrived to an enthusiastic reception at OR Tambo International Airport. 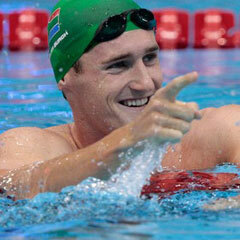 Johannesburg - South African Olympic swimming gold medallist Cameron van der Burgh arrived home on Thursday just after sunrise to a tumultuous welcome from hundreds of supporters and said a few things were going to have to change. "I woke up on the plane this morning and was turning on my phone and I had to put my pin number in. That's when I realised that since the age of 10 I've been using 2012 as my pin number," Van der Burgh told a news conference broadcast live on all three of South Africa's main television stations. "But now that I've won gold in the 2012 Olympics, I've achieved that goal and, for the first time in 14 years, I'll have to change my pin," said Van der Burgh, the winner of the 100m breaststroke in a world record time of 58.46 seconds. Compatriot Chad Le Clos snatched gold in the final stroke of the 200 butterfly from American Michael Phelps, who retired as the most successful Olympian in history with 18 golds and 22 medals overall. The 20-year-old from Durban said he was still coming to terms with beating his hero in London. "It was a very special Olympic Games for me and the last time I raced against Michael Phelps. He is such an inspiration for me and the last time we met before the Olympics, I was asking him for hundreds of photos and his caps and goggles," Le Clos told the same news conference in Johannesburg. "I'm still a great fan of his and it was the most overwhelming feeling to beat him. It just shows that you should never give up on your dreams, no matter how far behind you are in the race." Both swimmers said they wanted to build on their London success and win more medals at the 2016 Rio de Janeiro Games. Le Clos added a silver medal in the 100m butterfly to lift South Africa to fifth in the swimming medals table, ahead of aquatics powerhouses such as Australia and Russia. "Chad and I spoke about it on the flight from London and we have the opportunity to change South African swimming, we really want to take swimming forward," Van der Burgh, 24, said. Le Clos added: "In 2016, we'll obviously have targets on our back, which means more responsibility and added pressure for us. But that just makes me excited to get back in the pool and train harder." South Africa's head swim coach, Graham Hill, said he expected more success in Rio. "We've only just begun and in 2016 these two young guys will be well and truly prepared, plus there's a lot of young talent that wasn't at these Olympic Games. So it all looks good for the future," Hill said.